I've been giving my brayer a work out the last few days. I wanted to try my hand at a beach scene. Michelle Zindorf has wonderful tutorials that make it seem effortless. However my experience has been that they are a lot of work but very rewarding! This card is already on it's way to my friend Deb from Inspire Swap Chat. 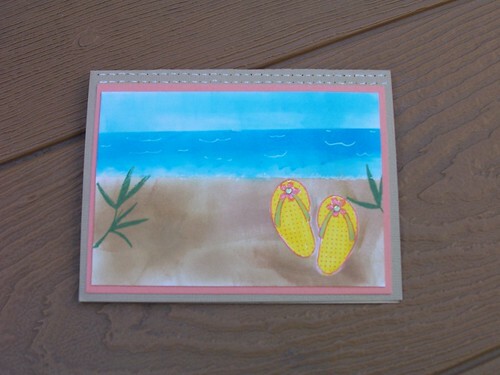 She loves the beach and has sent me so many beautiful beach cards she made. My card is not as great as hers but I think she'll like it.